TORONTO — He's paid his dues, time after time, and now Paul Massey is finally the champion. 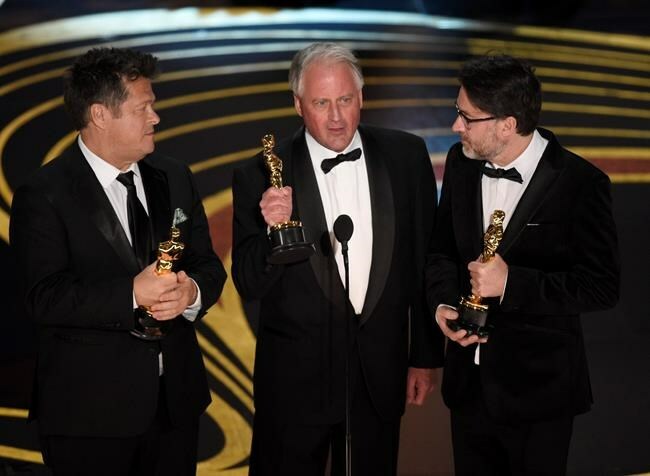 After seven previous visits to the Oscars for nominations he didn't end up winning, the Canadian sound engineer finally snagged the golden statuette on Sunday for his work on "Bohemian Rhapsody," about British rockers Queen and late lead singer Freddie Mercury. "I'd gotten used to sitting there and they say, 'And the Oscar goes to,' and the envelope opens up and it's obviously not me," Massey said in a phone interview a day after the show in Los Angeles. "It was kind of an out-of-body experience when they said 'Bohemian Rhapsody' and I was very, very happy. ... My heart was just going a million miles a second when the envelope opened up and then you jump up and realize you've got to go speak in front of all these people," he said. "It's a little bit terrifying but exciting." Massey won the trophy alongside Tim Cavagin and John Casali in the category of best sound mixing. It was his eighth Oscar nomination, after previous nods for films including "The Martian," "3:10 to Yuma," "Walk the Line" and "Legends of the Fall." "Bohemian Rhapsody" also won Oscars for sound editing, film editing and lead actor for Rami Malek. Queen guitarist Brian May and drummer Roger Taylor, along with singer Adam Lambert, kicked off the show performing a version of the band's hit "We Will Rock You." "The entire audience was up and clapping and singing along," Massey said. "It was a very celebratory mood." After the show, Massey and others from the film went to the Governors Ball, where he walked around with his Oscar and was stopped by people who wanted to take a picture with him and the coveted award. The revelry continued to the 20th Century Fox party, where May and Taylor joined them. "I think they very sensibly bailed out, or at least I didn't see them for the rest of the evening," Massey said of the Queen rockers. "Then a bunch of us piled into another car and we went to the Vanity Fair party, which went on into the night. After trying to get somewhere else I said, 'I think I've had enough' and got home about four o'clock in the morning." Massey was born in England and moved to Toronto in 1977 at age 19 to work in the music business. He worked in the city for 13 years, eventually moving into TV and film post-production, before moving to Los Angeles to concentrate on features. May and Taylor were "so collaborative right from the very beginning" of "Bohemian Rhapsody," said Massey, noting it was "a family experience" that continues to this day. Recreating the large-scale Live Aid benefit concert in London where Queen played in July 1985 was tricky and "took a long, long time" to perfect the sound, he said. "It's the peak of the film, so emotionally the whole film had to build to that," Massey said. "And the four songs that are featured in the film at Live Aid, there had to be an arc. We couldn't come out all guns blasting on the first song as much as on the last song." Ultimately, it resulted in a career-high. "I don't want to insult anyone, but this is my most favourite movie I've ever worked on," Massey said. "For me, it was bringing my music-mixing background into the film-mixing world and just being able to collaborate so closely with a small, close-knit group of people. And then of course you're listening to Queen the entire time, it's so iconic. "It's not like it's a band that no one has heard of. Everyone knows the music and it's just been a delight."